You will need to arrange for someone to drive you to and from the surgery center. Patients cannot drive after surgery, and for 10 days afterward. Recently sedated patients will not be placed into taxis for transport home. Medical transportation can be arranged in the event that you cannot find someone. It is also mandatory to have someone stay with you for at least 24 hours after surgery, for your comfort and safety. This will be less of an issue if the determination is made that you will stay in an observation unit overnight after the procedure. There are different ways to perform the Tummy Tuck, (Abdominoplasty). These are determined by the individual's anatomy, tissues, and goals. You will need to have someone drive you home from the surgery center. Again, Less of an issue if it is decided that you will stay overnight in an observation unit. You should also have someone stay with you the first couple of days after you go home. You will also need someone to drive you to your visits to the Doctor. Remember, no driving for 10 days after the procedure. Any discomfort following abdominoplasty, is usually controlled well with the prescribed pain medication. Since excess tissue will be taken from your abdomen, it will be difficult for you to completely "straighten up" for a few days. Tightness will progressively disappear. You must change your position and walk around the house every few hours. The post operative garment, (elastic abdominal binder), will provide gentle pressure to give you stability and support, and to reduce swelling. You may shower after removal of the dressings 2-3 days after the procedure. Many patients wear the binder for several weeks and some choose to wear it for several months. You should be able to gauge your comfort level. Although you will be up and around in a day or two, you should plan to take it a little slower the 2-3 weeks. After the first two weeks you may resume moderate walks. We will examine you after the procedure, and the stitches will be removed from around the belly button 5-7 days after surgery, the remaining sutures in the skin 14-28 days after surgery. If your work is sedentary, you will probably return to work in 10-14 days after discussing this with the Doctor, knowing that you may be sore. Do not plan on resuming aerobic or strenuous excercise for about 5-6 weeks after surgery. Let your body be your guide. Sun exposure is discouraged for at least the first few months. The extent of the operation may effect the length of recovery. 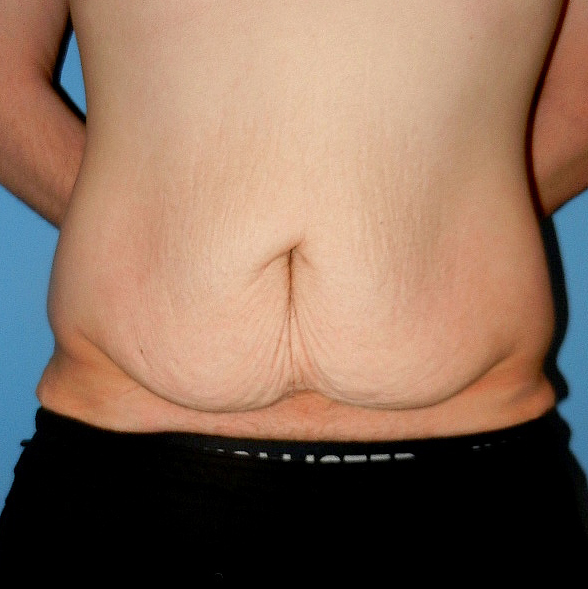 The "Mini Tummy Tuck", (Mini-Abdominoplasty with Abdominal Wall Plication), is not as extensive an operation. Recovery is usually significantly faster. What does a Tummy Tuck Procedure do? 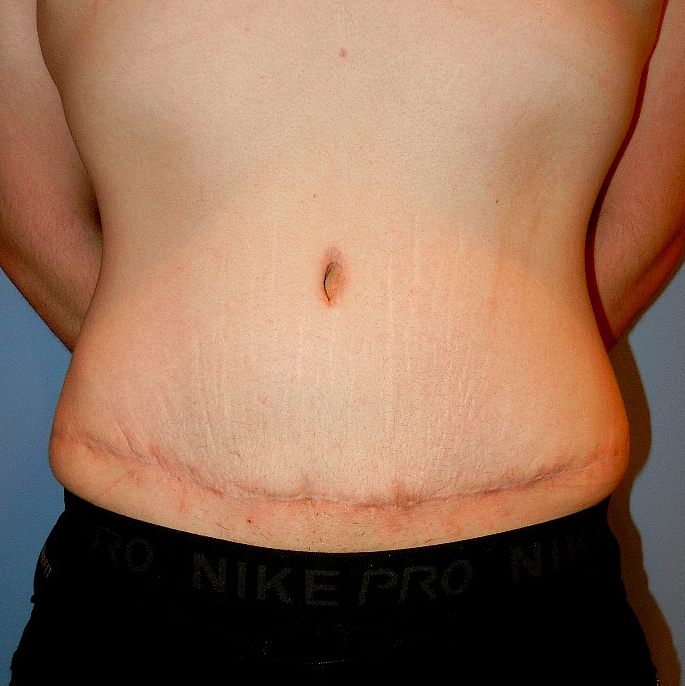 Can the Abdominoplasty or Mini-Abdominoplasty be combined with other procedures? Yes. This occurs frequently, (especially in the case of the Mini-Abdominoplasty). this can be discussed at the consultation. How is a “pain pump” used in this procedure? The small catheters are placed into the surgical area while you’re asleep. The reservoir is about the size of a baseball, and it fits into a fanny pack. It delivers medicine through little catheters to where you need it most. Patients typically take less pain medicine by mouth, and generally are more mobile, faster. Can I have a baby after an Abdominoplasty or Mini-Abdominoplsty? Yes. The body typically secretes the proper hormones, allowing the abdominal wall and other structures to relax and create enough space for the baby.